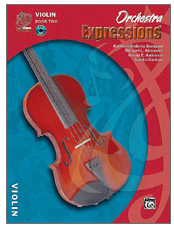 Orchestra Expressions™ provides music educators at all levels with easy-to-use, exciting tools to meet daily classroom challenges and bring new vibrancy and depth to teaching music. The lessons were written based on the National Standards for the Arts in Music -- not retro-fitted to the Standards. The program is music literacy-based and satisfies reading and writing mandates in orchestra class. The pedagogy involves a "four-fingers-down" start for every instrument and separate but simultaneous development of both hands.